Powered by Electricity, Gas or live steam. 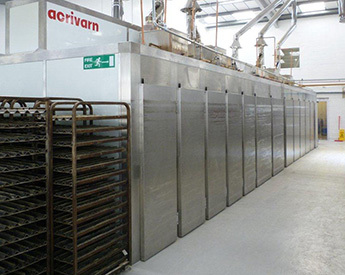 Incorporating Acrivarn’s patented Air Circulation System, our proofers (sometimes known within the baking industry as provers, proving cabinets or steam press) allow the highest possible standards of product proving to be achieved. Humidified air is recirculated throughout the proving cabinet continually at a rate of approximately 2.25 times per minute. 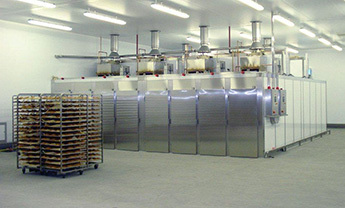 Stainless steel ducts blow high velocity air at floor level to maintain a totally dry surface throughout the proofer. A sensor monitors the re-circulating air continuously and controls the heat and humidity to maintain the desired conditions within the proving cabinet. The temperature and humidity of the air is the same throughout the proofing cabinet regardless of size or configuration. The floor of the cabinet remains dry at all times without the need for drainage, heating or insulating the floor. All Acrivarn proving cabinets are supplied with protective bumper rails and internal lighting as standard and are guaranteed for five years against corrosion.